The Earth's last frontier, the ocean, is being revealed to non-scientists for the first time with the introduction of Blueye Pioneer, an underwater drone that can dive eight times deeper than the average scuba enthusiast -- up to 150 meters. Developed by Blueye Robotics, the Pioneer has capabilities that were previously found only in expensive professional equipment used by filmmakers, oceanographers and the military, but is priced at consumer levels with a user experience unlike any other underwater drone. Blueye Pioneer's HD wide-angle video camera uses special technologies that work in low-light conditions and can communicate true-color images, overcoming the problem of how colors change below 16 feet underwater. "Red colors start to fade, and the undersea world becomes green or blue," explained Christine Spiten, Co-founder and Strategy Director of Blueye Robotics. "A custom algorithm was developed to add color back in to photos and video captured by the Pioneer. Now the mysterious realm of the ocean will be accessible to anyone with a smartphone, tablet or PC in full HD quality." Developed in the extreme conditions of the Arctic Ocean, Blueye Pioneer has a unique combination of compact size (15 lbs. ), power (three robust thrusters) and stability. 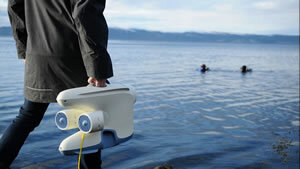 Unlike other underwater drones, it can perform flawlessly in rough currents and low temperatures thanks to its unique hydrodynamic balancing design. Blueye Pioneer travels at a speed of 2.5 meters/second (5 knots). Scientists may use Pioneer for environmental monitoring, and fish farmers, owners of offshore wind parks and other ocean-based enterprises can also utilize the drone's capabilities to stay in control of their underwater operations. Early customers include The Norwegian Society for Search and Rescue, Redningsselskapet and the World Wildlife Fund (WWF).